A project to make historic photographs available via the internet will continue to move forward, thanks to a donation from the Midco Foundation. The South Dakota Historical Society Foundation received a $1,000 donation from the Midco Foundation for the digitization of photographs from the South Dakota State Historical Society–Archives. In the digitization process, photographs are scanned and placed within the South Dakota Digital Archives. This enables people to view the digitized images via the internet. “The digital archives are accessed daily by users from all across South Dakota and beyond. In an average month, more than 3,000 users are accessing more than 15,000 images in the digital archives,” said State Archivist Chelle Somsen. The online photographs can be found on the State Historical Society–Archive’s website, www.history.sd.gov/archives and then clicking on SD Digital Archives. The archives contains more than 1 million photographs and other images from the territorial period to the present. In the eight years of the digitization effort, more than 55,000 images have been scanned and placed within the South Dakota Digital Archives. Before the digitization program, those same images would have only been available at the State Archives at the Cultural Heritage Center in Pierre. The work to digitize the photographs is not funded by any general funds from the state of South Dakota, according to Foundation President Michael Lewis. The foundation is the nonprofit fundraising partner of the South Dakota State Historical Society. “The South Dakota Historical Society Foundation has annually raised the necessary funds to make this project a success and continue this important and valuable work,” he said. The Midco Foundation is the charitable arm of the Midco families of companies. Established in 1987, the Midco Foundation provides funding assistance to charitable entities to enhance the quality of life in communities where Midco employees live and work. 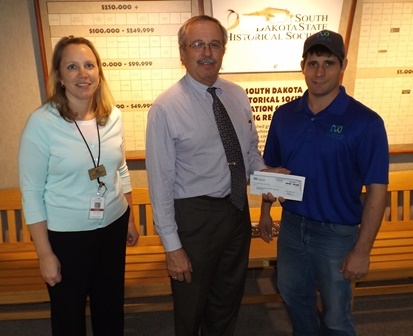 Midco previously donated to the “South Dakota Experience” exhibition in the museum of the South Dakota State Historical Society at the Cultural Heritage Center.